There are more Latino candidates, but they're competing against more people in the primaries. Even so, could it help voter enthusiasm? WASHINGTON — An unprecedented number of Latinos are running for office in the 2018 primaries, but crowded fields have toughened the challenge of getting elected for some candidates of color and women. 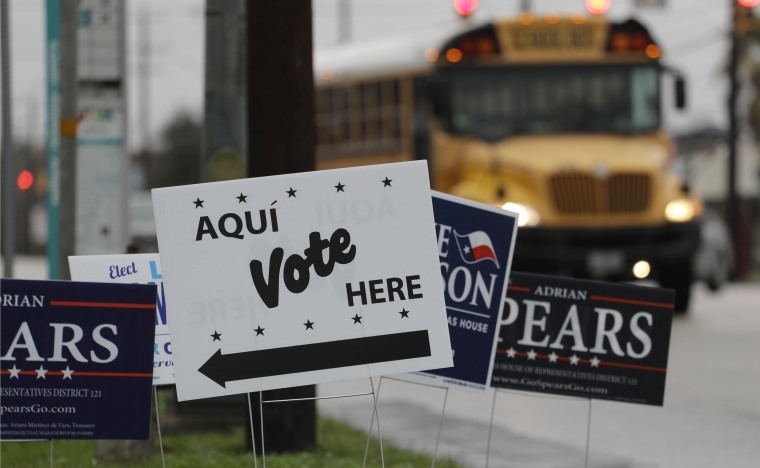 Primary season kicked off with the Texas primary on Tuesday. Democrats turned out in droves for early voting in a year when the state has some of the most competitive congressional and statewide races. Democrats stand their best chance in years of regaining control of the U.S. House. But the anti-Trump sentiment that is mobilizing Democratic voters has also crowded the field in several congressional districts where many Latinos are found. And Trump has inspired “outsider” interest, with people outside the political realm jumping into races. “The bar is even higher than I had anticipated,” said Mayra Macias, political director for the Latino Victory Fund, which works to get Latino Democrats elected to public office. The crowded field makes it that much harder to raise money for campaigns, already a challenge for many women and minorities. How much money a candidate can raise is often how national organizations track a race and is a factor in deciding whether they back a candidate. “It’s in the primaries where you have national interest groups that have the resources to really effect an election," Macias said. "With a couple thousand dollars you can really make an impact on some of these primaries." Sylvia Garcia, a former state senator in Texas, was the early favorite to win the Democratic primary to replace retiring Rep. Gene Green in his heavily Hispanic Houston district, the 29th Congressional District. But there are six others also vying for the seat, including a wealthy health care executive, Tahir Javed, who has a lot of personal money to spend. Garcia and Veronica Escobar — a former county judge in El Paso, Texas, who is running to replace O'Rourke in the House — would be the first Latinas elected to Congress from Texas if they win their primaries and general elections. Things were made even more challenging for Garcia after Senate Majority Leader Chuck Schumer, D-N.Y., endorsed Javed, upsetting Latino advocates who have backed Garcia, along with other Democrats and Democratic groups. Javed had held a major fundraiser for Schumer so his endorsement was seen as returning the favor. In Massachusetts, state Rep. Juana Matias is seeking to become the state's first Latina elected to Congress, but first she must get past 12 other Democrats in the primary. The House seat opened when Rep. Niki Tsongas, a Democrat, announced her retirement. Macias, of the Latino Victory Fund, said Matias has "an uphill battle, and we see that in our Democratic seats" being sought by other Latino candidates. In Florida, the race to replace retiring Rep. Ileana Ros-Lehtinen, a Republican, has drawn nine Democrats and seven Republicans, including several Latinos. The seat is considered a good chance for Democrats to pick up a Republican-held seat. In California, multiple Latinos are running in various races, but with a “jungle primary,” where the top two vote-getters move ahead to the general election, there is a fear among Democrats of splitting the Latino vote. Difficult as it may be to have so much competition, the number of Latino contenders could help draw Latino voters out for the primaries. According to the Pew Research Center, Latino turnout in 2014, the last midterm election, fell to a record low. While a high of 6.8 million Latinos voted that year, just 27 percent of the electorate showed up, compared with 31.2 percent in 2010. There are hopes for something different this year. Early voting in Texas, which ended Friday, is up in 15 major counties, with Democrats casting nearly 45,000 more votes than Republicans. According to the Texas Secretary of State, 465,235 Democrats voted early in the 15 counties, compared with 420,329 Republicans. It’s a trend seen in other recent elections. In Virginia, where the governor’s seat, the House of Delegates and other statewide and municipal offices were on the ballot last November, the Latino turnout was up 6 percentage points, according to analysis by the Virginia Public Access Project. The state elected its first two Latinas to the House of Delegates. A big unknown this election cycle is young people. The Latino electorate trends young, with millennials making up some 44 percent of the Latino electorate. Although young Latino voters have not been reliable when it comes to turning out at the polls, Maria Teresa Kumar, co-founding president of Voto Latino, which encourages Latinos to register and vote, said she is seeing energy among younger Latinos this year. For a voter registration program in El Paso, Kumar said her group went to Texas with one full-time staffer and the hope of finding four to six volunteers. It got 15. The group also hoped to register 120 voters in two and a half weeks, but ended up registering 725 people. “It’s a markedly different state than when we first came in," in 2010, Kumar said. “All these young people came of age in harsh conditions." Kumar said there is a different level of activism in the state, some of it organized in opposition to the state's immigration policing law, SB4. Kumar said those wanting to turn out Latino voters should “take our cues from what happened in Virginia and Alabama” elections won by Democrats. Lizet Ocampo, political director at People for the American Way, a progressive advocacy organization, said despite the tougher competition for Latino candidates, the additional candidates mean more people trying to get Latino voters engaged. Her group is hoping that that engagement filters to governor and legislative races, particularly in the state Senate where Democrats need five seats to take control of the chamber in the statehouse. CORRECTION (March 6, 2018, 12:10 p.m. ET): A previous version of this article misspelled the first name of a retiring Democratic congresswoman from Massachusetts. She is Rep. Niki Tsongas, not Nicki. The article also dropped the first name of a state representative running in the Democratic primary to replace Tsongas. She is Juana Matias.